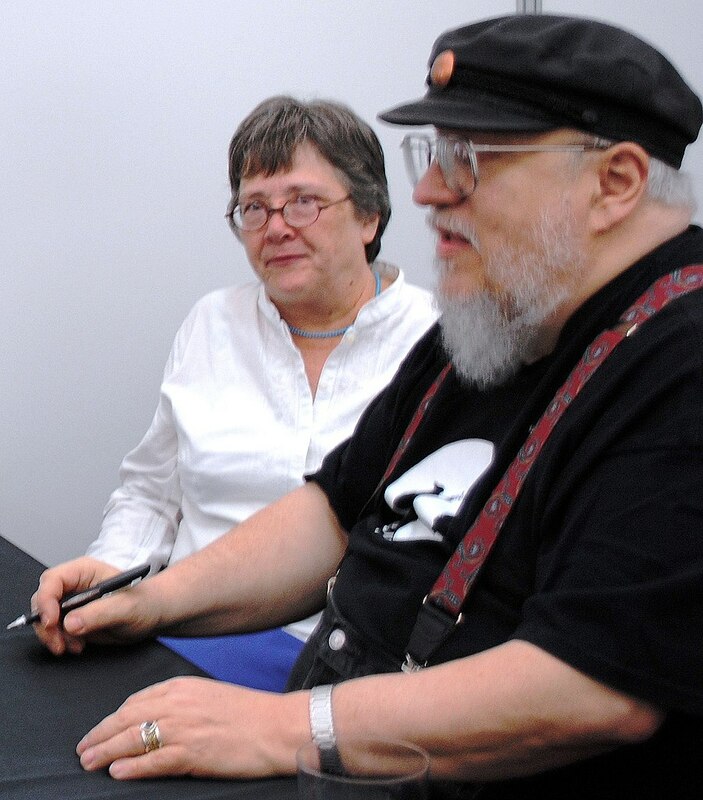 Photo from Lisa Tuttle’s personal files, showing the author with George R. R. Martin, in October, 1974. In the picture, from October 1974, we can see her and George. 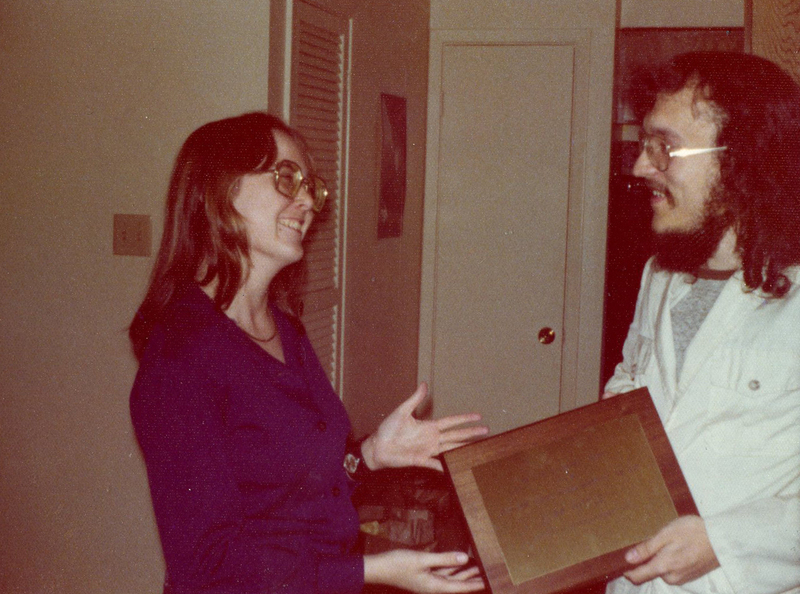 Martin went to visit her in Austin, to deliver the John W. Campbell Award for new authors – that Tuttle had won in that year’s Worldcon, but couldn’t manage to receive in person. The first part of Windhaven was written sometime in that year. Arthur Maia: How was Windhaven officially born? Was the first idea you and George had about a world where people could hardly sail and the flyers were needed, or was it about Maris, a girl who dreamed of flying but didn’t have the right blood for that? Lisa Tuttle: Windhaven began early in 1974, after we had discussed the idea of collaborating on a short story for several months without coming up with an idea we were both equally excited by. Then George offered up two “idea germs” from his files for me to consider. No plot or characters, but something he thought could be worked up into a good story. One was about a future in which humans had adapted to live beneath the sea, the other was set on an ocean planet on which a star-ship had crash-landed generations before. The survivors used their remaining tools to transform the immensely strong, light cloth-metal of the starship sail into glider-type wings which enabled individuals to “fly” on the strong storm-winds from island to island, much more quickly than travelling through monster-infested, stormy seas in small wooden boats. It is a dangerous job, and the flyers are glamorous figures. They inherit their status: the wings are handed down in the family. This suggested conflict: who gets the wings if there are twins? I liked that idea, and I wanted the main character to be female. Why should flyers only be men? But I didn’t want to write about a young woman determined to join an all-male society, struggling with the same prejudice and barriers that existed in the 20th century, or worse. I was a feminist, formed by the Women’s Liberation Movement that started in the USA when I was a high school student. I was hopeful, and expected to experience many more positive changes towards equality in my lifetime. So even if our ship-wrecked colonists had been forced into a more primitive way of life on this distant planet, where metal was very scarce and the future technology and much knowledge had been lost, I did not want to think that all social advances had also been wiped out. This was science fiction – we did not have to be limited to the way things had been in the past! I imagined a more egalitarian culture. None of this is explained or even mentioned in the book, but it was in the thinking behind it – I discussed it with George. My idea was that in the future women would control their own fertility, without needing to take pills, have operations or use any high-tech solutions, and that this ability (possibly genetically linked, but at any rate established centuries before star-travel), since it meant men could not forcibly impregnate a woman against her will, and women could not “accidentally” become pregnant, or have a period at an inconvenient time …although some would be infertile, and there would still be situations where two people who wanted a child were unable to conceive, no pregnancy, or child, would be unwanted. Families would tend to be smaller. And there could be absolutely no “biological” reason to restrict women from any jobs a man could do. So, we kept the idea of primogeniture – the wings would go to the first-born in a flyer family – but instead of twins (who after all might share…and one must have emerged first!) , I thought it would be more interesting to create a culture clash and would question the whole established tradition,– if our hero/heroine came from a non-flyer family, maybe a dead fisherman’s child who was adopted by a flyer with no children and was trained to be a flyer, and expected to have her own wings someday….until…. a legitimate heir was born, and suddenly she lost her right to the only life she truly wanted. Arthur Maia: When The Storms of Windhaven was written, back in the first half of the 70’s, did you already conceive the concept for One Wing? Did you feel that the way Maris found to organize the flyers’ society would need a counterpoint? Lisa Tuttle: By the time we had finished writing that first story we already knew we wanted to write more about Windhaven – but we hadn’t made up our minds if it should be another story about Maris or not. I remember discussions about a story called Windship which would have been set many decades – maybe even a century – after Maris’s changes had taken place, but apart from the idea that someone would design and build wooden aircraft – gliders of some sort, able to carry goods and at least one passenger if not more – I don’t remember much about it. In the end, we decided to look at the results of the first batches of academy-trained flyers, and how flyer society was just beginning to deal with these changes…and so One-Wing was born. Lisa and Martin in Avilés, July 2012. Photo: HombreDHojalata. Arthur Maia: How do you see Val One Wing? Was he the needed counterpoint and his actions were justified by his conditions or does he really lack empathy? Lisa Tuttle: I can’t answer for George, but I think Val was formed by his background and made a deliberate choice to ignore his softer feelings. Of course, he could feel empathy for others…he wasn’t a psychopath!….but he repressed that ability in order to protect himself. He had a huge chip on his shoulder (as we say in English) and was embittered by his experiences. I think Maris felt a grudging sympathy for him – without liking him – and my feelings are similar. Unfortunately, in situations of scarcity and conflict, any time there are “losers” and “winners”, many people, like Val, will always put their own interests ahead of everything and anyone else, even turning on the people who could help them. Arthur Maia: There’s no clear religion in Windhaven, was there any discussion between you and Martin about creating one? If so, why did you decide to leave it out of the book? Lisa Tuttle: We never talked about religion that I can recall. We did drop a few hints to suggest that there were several religions on Windhaven – in Southern they worship a Sky God, and I think somewhere else the flyers were priests. (It is a multi-cultural world! ) Maris is certainly non-religious, and one gets the impression that her home archipelago of Western is entirely secular; if there is a church, it lacks power. This probably reflects the authors’ own interests at that time – religion did not feature very largely. Speaking for myself, I probably imagined that in centuries to come religion would have withered away, and been an entirely personal matter, of no great social or political significance. As the world is today, that does seem foolish! Arthur Maia: Windhaven just turned into a graphic novel, illustrated by Elsa Charretier, did you have the opportunity to take a look at that? How do you feel about the adaptation? Lisa Tuttle: Well, I wrote the adaptation myself…. so what can I say? It was my first time writing a script, and I enjoyed the challenge of translating a novel into this new form. I hope I did a good job, but others will have to judge that. Of course, I had to read and reread the book with close attention, so it is still fresh in my mind — which is why I am able to answer your questions about something George and I wrote together almost forty years ago! I absolutely love the artwork. Elsa Charretier is incredibly talented, and our colourist, Lauren Affe, also did a great job. It looks so fresh and new – I think it’s wonderful, and hope it will appeal to a whole new audience, as well as to those who already love our original novel. 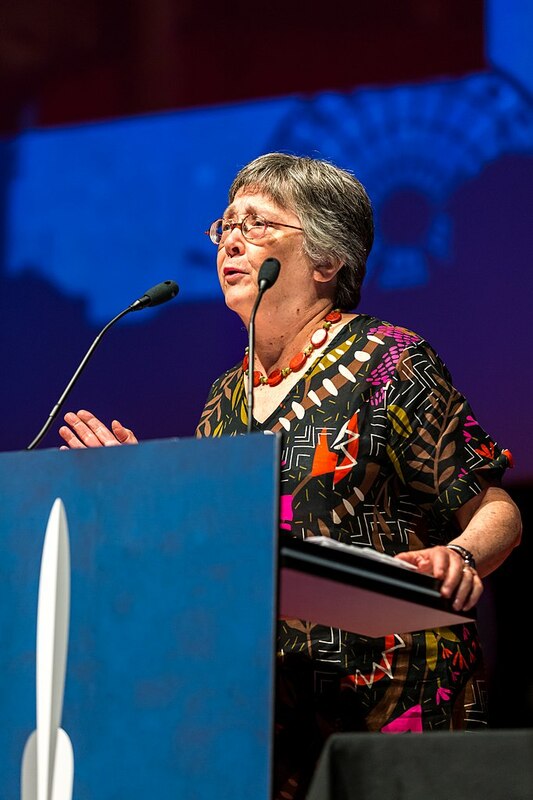 Lisa at 2017 Hugo Awards ceremony, in Helsinki. Photo: Sanna Pudas. Arthur Maia: Unfortunately, we only have two of your stories published in Brazil, the Windhaven and The Curious Affair of the Deodand. What would you suggest for your Brazilian readers as a next step? What stories would you like to see published here? Lisa Tuttle: If readers liked The Curious Affair of the Deodand they might be interested to know there are two novels featuring the same characters, Jasper Jesperson and Miss Lane. Like the short stories, they are mysteries with a supernatural element set in 1890s England. The first is The Curious Affair of the Somnambulist and the Psychic Thief followed by The Curious Affair of the Witch at Wayside Cross. I have had a lot of short stories published, most of them are on the dark side of fantasy – ghost stories, horror stories, strange stories of all kinds. And I’ve written two contemporary fantasies, set mostly in Scotland, which combine a real world setting with Scottish legends and Celtic lore. An earlier novel about alternate realities, Lost Futures, which was nominated for the Arthur C. Clarke Award, has been getting a good response since a Spanish translation was published last year in Spain by Gigamesh (the Spanish publisher of George’s other books). Arthur Maia: Speaking of women writing science fiction and fantasy, do you have any recommendations for our readers? Either classics or new writers that you think that should be better known. Lisa Tuttle: The classic writers are easier to list – although I have no idea what has been published in translation. Any list of “must reads” would have to include Ursula LeGuin, Kate Wilhelm, Joanna Russ, Suzy McKee Charnas and Pat Cadigan (since she has not slowed down and is now working on another eagerly awaited novel, Pat might object to being put on a list dominated by the dead….but hey, you don’t have to be dead to be a classic.). Other of my personal favourites include Elizabeth Hand and Karin Tidbeck, and I am looking forward to reading Anne Charnock, who just received the Arthur C. Clarke Award for her novel Dreams Before the Start of Time. And I know there are a lot of really good new writers out there – the list of books I want to read just keeps getting longer and longer.